Think you got it bad? Malone's proofs of real compassion, insight, loving-kindness, and mindfulness in the face of the most extreme torments and challenges may give you pause and perspective. A warm, humorous, whole and inspiring work, and a kind of miracle. Razor-Wire Dharma is an eloquent, enlightening, and utterly inspiring personal story of how one man found Buddhism--and real, transformative meaning--despite being in one of the world's harshest environments. Some of these stories are hilarious, some are harrowing, but all express Buddhist wisdom as vividly as any practitioner could hope to do--in the unlikeliest of places. In prison, the choice of staying true to principles often requires jeopardizing life, safety, and the few small comforts available to try to do what's right. 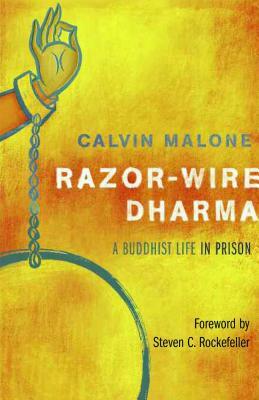 Calvin Malone began practicing Buddhism soon after he entered prison in 1992 and started writing about his prison experiences shortly thereafter. He has published numerous articles in Buddhist magazines and newsletters.